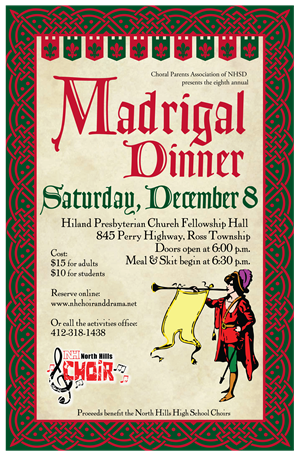 North Hills High School Choirs will hold their eighth annual Madrigal Dinner on Dec. 8 in the Hiland Presbyterian Church Fellowship Hall at 845 Perry Hwy. in Ross. Please note the new location. Attendees are invited to enjoy a trip back to the Renaissance as the facility is transformed into a banquet hall complete with a royal procession, singing and entertainment. Doors open at 6 p.m., and festivities begin at 6:30 p.m.
Tickets are $15 for adults and $10 for students and can be reserved online at www.nhchoiranddrama.net or by calling the North Hills Athletics and Activities office at 412-318-1438. Seating is limited, so reservations are strongly encouraged. Online reservations can be paid for with credit cards, PayPal or cash at the door. The fundraising event is sponsored by the North Hills Choral Parents Association. The evening will include a home-cooked pasta meal served by choir members, while the Madrigal Players will present a 15th century-style skit in period costumes with music provided by the Madrigal Choir comprised of North Hills students. This year’s skit, presented during dinner, “To Play or Replay” brings the audience into an unusual setting of “Little Red Riding Hood.” Following the meal, Madrigal Choir members will perform a mini concert of traditional holiday carols. A Madrigal dinner is a 21st century recreation of the Renaissance feasts held in the great baronial halls throughout England during the twelve days of Christmas. The feasts were filled with stunning pageantry, bawdy humor, endless amounts of succulent food and extraordinary music. Raffle baskets will be available during the evening. Proceeds will benefit the North Hills Choral Program’s continuing activities including this spring’s music department tour to New York City and Messiah College.